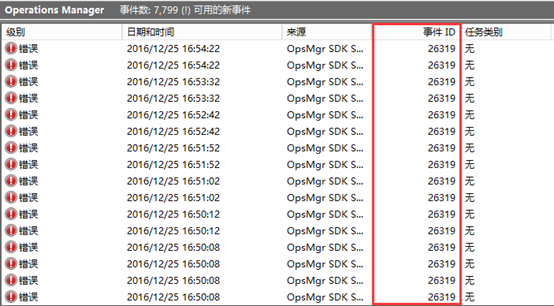 日期: 2016/12/26 9:07:22 应用程序: Operations Manager 应用程序版本: 7.1.10226.0 严重性: 错误 消息: 未能连接到服务器"BJ-SCOM**. 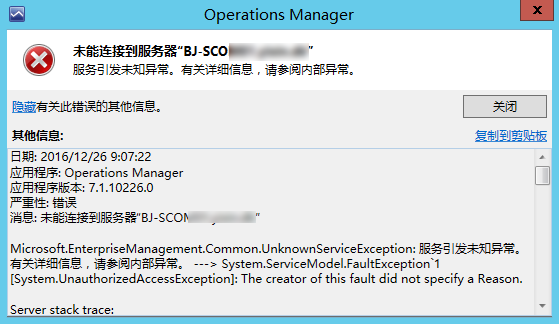 ****" Microsoft.EnterpriseManagement.Common.UnknownServiceException: 服务引发未知异常。有关详细信息，请参阅内部异常。 ---> System.ServiceModel.FaultException`1[System.UnauthorizedAccessException]: The creator of this fault did not specify a Reason. 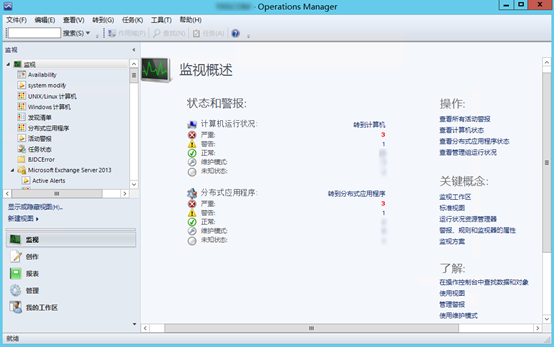 Server stack trace: 在 System.ServiceModel.Channels.ServiceChannel.HandleReply(ProxyOperationRuntime operation, ProxyRpc& rpc) 在 System.ServiceModel.Channels.ServiceChannel.Call(String action, Boolean oneway, ProxyOperationRuntime operation, Object ins, Object outs, TimeSpan timeout) 在 System.ServiceModel.Channels.ServiceChannelProxy.InvokeService(IMethodCallMessage methodCall, ProxyOperationRuntime operation) 在 System.ServiceModel.Channels.ServiceChannelProxy.Invoke(IMessage message) Exception rethrown at : 在 System.Runtime.Remoting.Proxies.RealProxy.HandleReturnMessage(IMessage reqMsg, IMessage retMsg) 在 System.Runtime.Remoting.Proxies.RealProxy.PrivateInvoke(MessageData& msgData, Int32 type) 在 Microsoft.EnterpriseManagement.Common.Internal.IDispatcherService.Connect(SdkClientConnectionOptions connectionOptions) 在 Microsoft.EnterpriseManagement.Common.Internal.SdkDataLayerProxyCore.Initialize(EnterpriseManagementConnectionSettings connectionSettings, SdkChannelObject`1 channelObjectDispatcherService) 在 Microsoft.EnterpriseManagement.Common.Internal.SdkDataLayerProxyCore.CreateEndpoint[T](EnterpriseManagementConnectionSettings connectionSettings, SdkChannelObject`1 channelObjectDispatcherService) --- 内部异常堆栈跟踪的结尾 --- 在 Microsoft.EnterpriseManagement.Common.Internal.ExceptionHandlers.HandleChannelExceptions(Exception ex) 在 Microsoft.EnterpriseManagement.Common.Internal.SdkDataLayerProxyCore.CreateEndpoint[T](EnterpriseManagementConnectionSettings connectionSettings, SdkChannelObject`1 channelObjectDispatcherService) 在 Microsoft.EnterpriseManagement.Common.Internal.SdkDataLayerProxyCore.ConstructEnterpriseManagementGroupInternal[T,P](EnterpriseManagementConnectionSettings connectionSettings, ClientDataAccessCore clientCallback) 在 Microsoft.EnterpriseManagement.Common.Internal.SdkDataLayerProxyCore.RetrieveEnterpriseManagementGroupInternal[T,P](EnterpriseManagementConnectionSettings connectionSettings, ClientDataAccessCore callbackDispatcherService) 在 Microsoft.EnterpriseManagement.Common.Internal.SdkDataLayerProxyCore.Connect[T,P](EnterpriseManagementConnectionSettings connectionSettings, ClientDataAccessCore callbackDispatcherService) 在 Microsoft.EnterpriseManagement.ManagementGroup.InternalInitialize(EnterpriseManagementConnectionSettings connectionSettings, ManagementGroupInternal internals) 在 Microsoft.EnterpriseManagement.Mom.Internal.UI.Common.ManagementGroupSessionManager.Connect(String server) 在 Microsoft.EnterpriseManagement.Monitoring.Console.Internal.ConsoleWindowBase.TryConnectToManagementGroupJob(Object sender, ConsoleJobEventArgs args) System.ServiceModel.FaultException`1[System.UnauthorizedAccessException]: The creator of this fault did not specify a Reason. 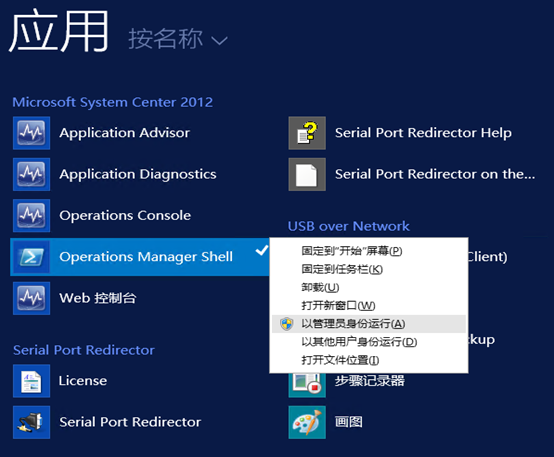 (错误详细信息等于 System.UnauthorizedAccessException: You have exceeded the evaluation period of this product. Please upgrade to the retail version to continue using the product. 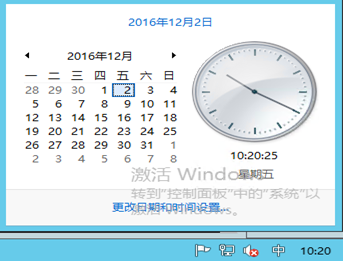 For information on purchasing the retail version of this product, go to http://go.microsoft.com/fwlink/?LinkID=74446. at Microsoft.EnterpriseManagement.ServiceDataLayer.SessionManagerService.CheckLicence() at Microsoft.EnterpriseManagement.ServiceDataLayer.SessionManagerService.Connect(SdkClientConnectionOptions options) at Microsoft.EnterpriseManagement.ServiceDataLayer.BasicDispatcherService.Connect(SdkClientConnectionOptions connectionOptions))。 错误代码：You have exceeded the evaluation period of this product. Please upgradeto the retail version to continue using the product. 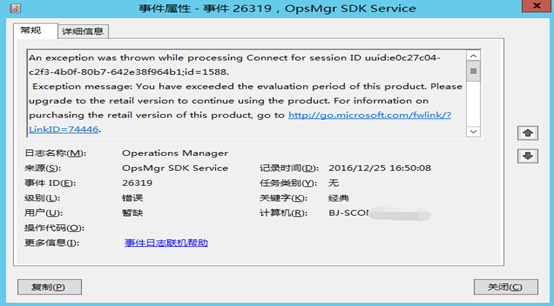 报错代码：You have exceeded the evaluation period of this product. Please upgrade to the retail version to continue using the product.